I’m loving all of the soft hues that are dominating clothing and accessories right now. I’m borderline obsessed, and not afraid to admit it. Is there a rehab center for those addicted to candy coated colors?! I love these pretty colors!!! Perfect for spring my beautiful friend!!!! I usually prefer bold colors, but the top is lovely. I kind of feel like you have been the pastel/sherbert Queen latley and I want all of your clothes. This top is so cute – I think I need it. The colors are so dreamy and I love the OTS vibe. You look fabulous! Qué colores tan monos! te alegran un montón! What a fun top! It’s so springy and absolutely reminds me of rainbow sherbet, which is the BEST! This top is so pretty on you! Love the pastel colors! 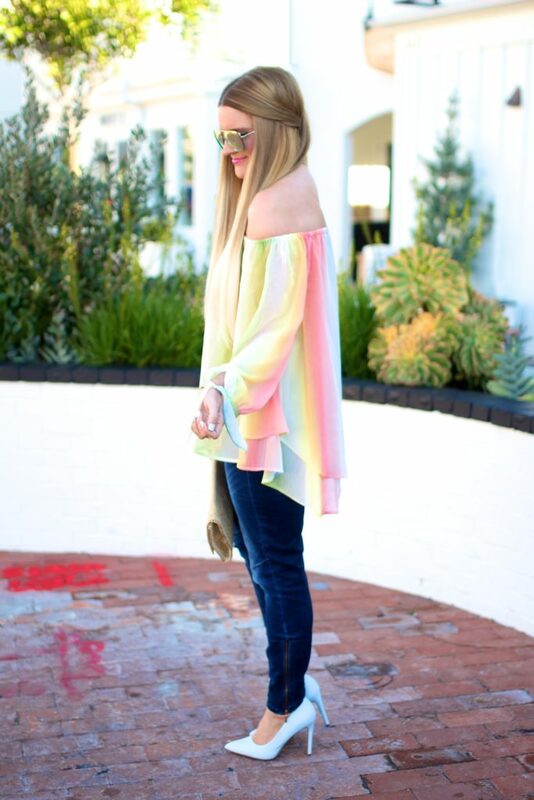 This is the perfect spring top! The color scheme is just beautiful! Omg I need this top! Love how colorful and fun it is. Cute shoes, too! I love this OTS top so much! Such a great find! haha! A rehab center!! I loved this top when I saw it last night on IG and love it even more today! The colors are so fun and springy and so perfect with the blue heels and that cute clutch!! Hope you have a great weekend, Shauna! The colours of the top are so beautiful and they go perfectly with the shoes!! I love this outfit! 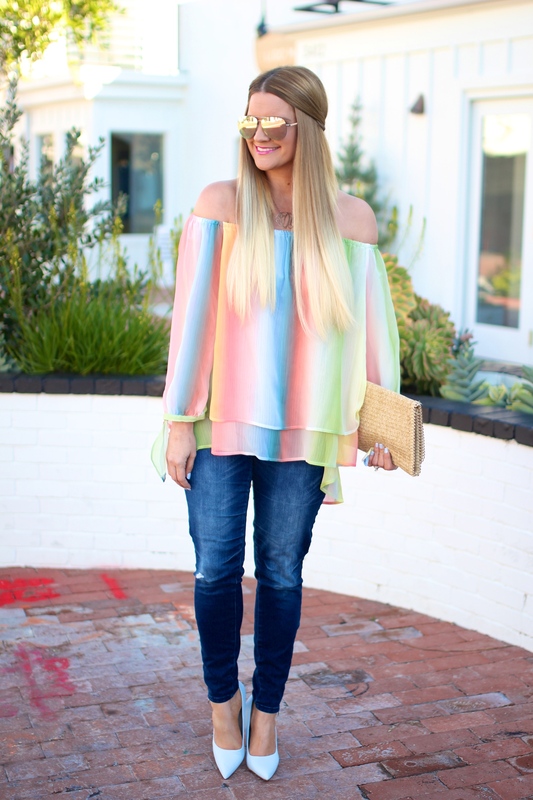 Rainbow sherbert is my favorite ice cream and this top reminds me of that in the best way possible! Love Love Love this springy look! That colorful top is so fun! Love how you styled it. This top has spring + summer written ALL over it! You always find the coolest pieces! Loving that top on you babe. This is such a fun top!! You have the cutest style. Love love love it! I love how your colorful outfits are so cheerful! 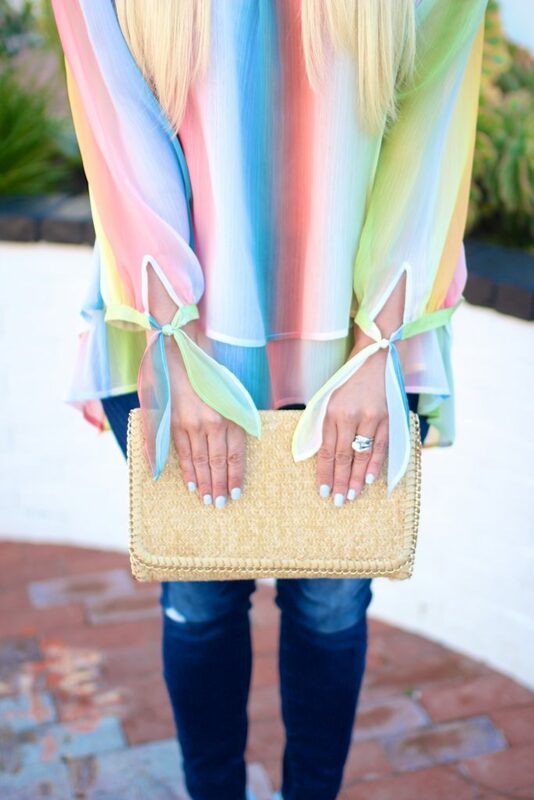 These pastel stripes are fabulous. I bet anyone who sees you thinks you must be the nicest girl…and they would be right! Have a wonderful weekend, my friend! I love your top.The colors are so beautiful. Loved this so much on insta! 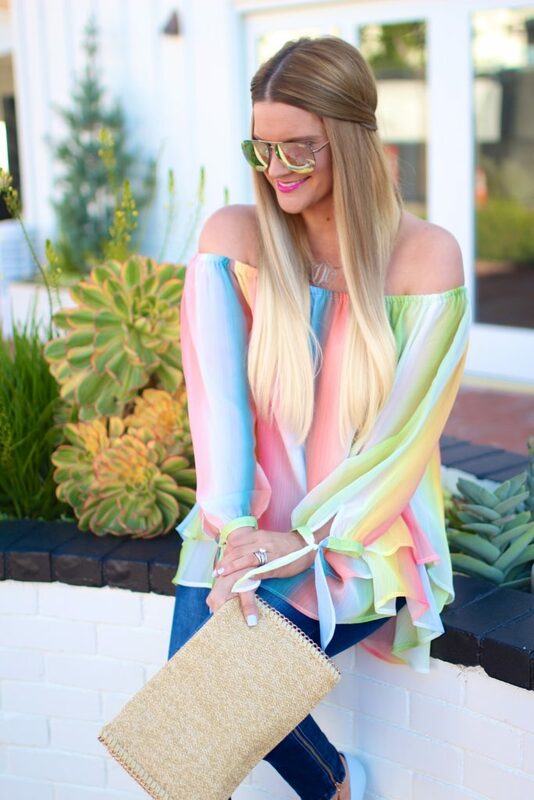 The colors in this top are amazing! Have a wonderful weekend, gorgeous lady! Such a beautiful top! The colors are so beautiful and giving me such spring fever. I love springtime on your blog…all the colours!!! 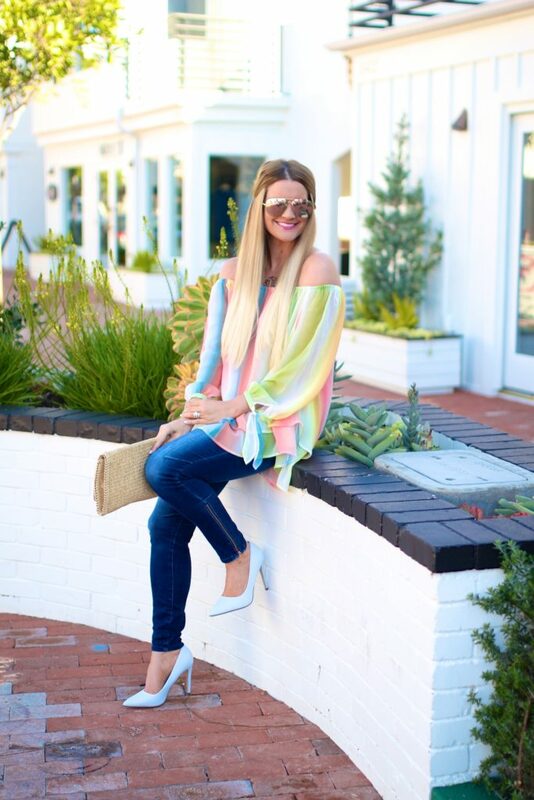 Loving that beautiful flowy top! You are looking gorgeous girl, that top is so unique! You look so beautiful in this top! It’s so pretty and the pastels are gorgeous! What a gorgeous top! Love the rainbow of sherbert colors and the ties on the sleeves! Have a great weekend Shauna! 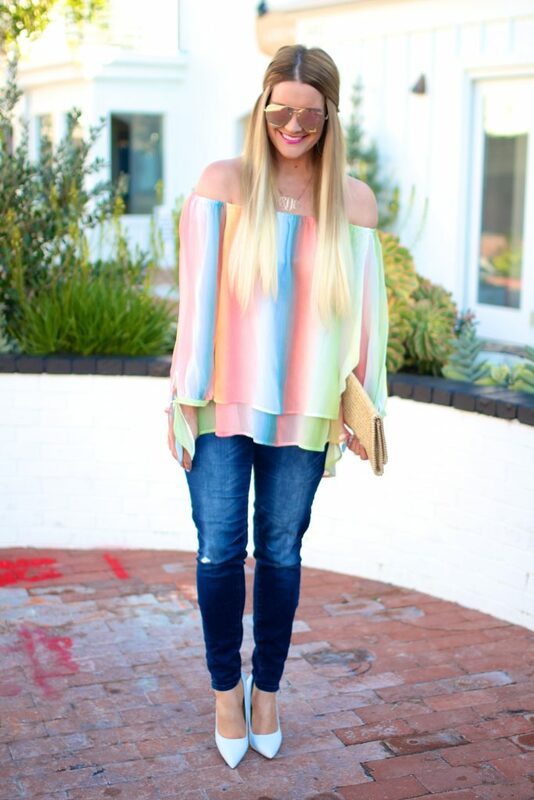 I love this rainbow color top ! The colours of the top are so pretty and they go perfectly with those fun shoes!